We've featured many wonderful Airbnb rentals on Inhabitat, but none are quite as mesmerizing as this beautiful fairytale-like treehouse for grownups. Located in Atlanta, the Secluded Intown Treehouse comprises three rustic cabins connected by suspended rope bridges and decorated with twinkling fairy lights. Made from reclaimed materials, the relaxing retreat accommodates two and comes stocked with wine and a basket of yummy snacks. Read on for more pictures of this magical Airbnb treehouse! Peter Bahouth, former Greenpeace executive director and current executive director of the U.S. Climate Action Network designed and built the Secluded Intown Treehouse after six months of design and six weeks of construction. Although the trio of treehouses were originally conceived as a way for Bahouth to enjoy more privacy away from his mostly glass modern home, he has since opened the treehouse to the public on Airbnb, where it can be rented at just $275 a night. Inspired by his work in environmental activism, Bahouth constructed his grown-up treehouse from recycled materials, including 80-year-old windows salvaged from a Masonic Temple in South Carolina. Bahouth named the three treehouses “Mind,” “Body,” and “Spirit,” and crafted different personalities for each. The “Mind” treehouse serves as a living room and comes with cozy seats, a rustic coffee table, and other antique knickknacks collected from flea markets. The “Body” contains the bedroom with an indoor/outdoor wheeled bed that can slide out onto a platform to let guests sleep beneath the stars and above a burbling creek. The third space named “Spirit” is a circular deck with seating for ten built around a 150-year-old Southern Short-Leaf Pine. It’s the small details that Bahouth adds that really makes his treehouse retreat feel like a magical wonderland. Bahouth’s eye for antiques and background as an artist helped him furnish the treehouse with meaningful, second-hand finds and original art. The salvaged butterfly windows open upwards like wings to let in cross breezes. 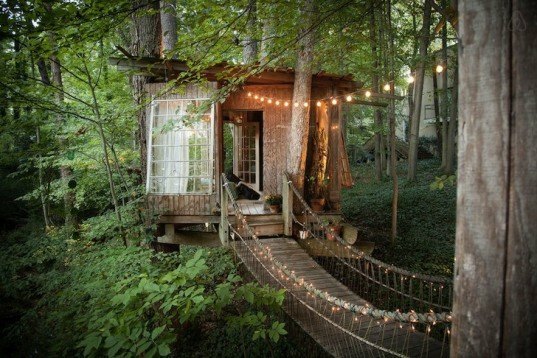 Each dreamy treehouse is linked together with ship-rope bridges strung with miniature white lights. If you’re hoping to book a romantic weekend getaway at the Secluded Intown Treehouse on Airbnb, you may want to hurry—reservations fill up fast! Peter Bahouth, former Greenpeace executive director and current executive director of the U.S. Climate Action Network designed and built the Secluded Intown Treehouse after six months of design and six weeks of construction. Although the trio of treehouses were originally conceived as a way for Bahouth to enjoy more privacy away from his mostly glass modern home, he has since opened the treehouse to the public on Airbnb, where it can be rented at just $275 a night. Inspired by his work in environmental activism, Bahouth constructed his grown-up treehouse from recycled materials, including 80-year-old windows salvaged from a Masonic Temple in South Carolina. Bahouth named the three treehouses "Mind," "Body," and "Spirit," and crafted different personalities for each. The "Mind" treehouse serves as a living room and comes with cozy seats, a rustic coffee table, and other antique knickknacks collected from flea markets. The "Body" contains the bedroom with an indoor/outdoor wheeled bed that can slide out onto a platform to let guests sleep beneath the stars and above a burbling creek. The third space named "Spirit" is a circular deck with seating for ten built around a 150-year-old Southern Short-Leaf Pine. It's the small details that Bahouth adds that really makes his treehouse retreat feel like a magical wonderland. Bahouth's eye for antiques and background as an artist helped him furnish the treehouse with meaningful, second-hand finds and original art. The salvaged butterfly windows open upwards like wings to let in cross breezes. 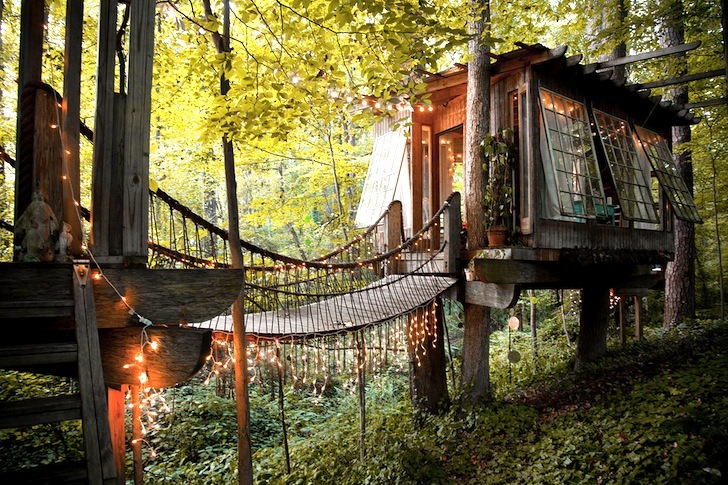 Each dreamy treehouse is linked together with ship-rope bridges strung with miniature white lights. The Secluded Intown Treehouse is located in the Buckhead neighborhood of Atlanta. If you're hoping to book a romantic weekend getaway at the Secluded Intown Treehouse on Airbnb, you may want to hurry—reservations fill up fast!